If The Dying Grass by William T. Vollmann were a painting, it would be a Rembrandt: complex, detailed, dark with flashes of vivid color. The Nez Perce War of 1877 provides the background for an exploration of the confrontation between cultures, neither of which understands the other except on a superficial level, and in the case of the United States government, clings to its preconceived belief that the Nez Perce must be confined and “civilized” for their own good and for the benefit of white settlers. Meeting with Joseph, his brother Ollicut, White Bird, Looking-Glass, and Toohhoolhoolzote, whom Howard continues to call a “Medicine Man,” the general tells them they are now under the jurisdiction of the government and must move onto the reservation. He also stages a demonstration of his newly acquired Gatling guns. Chief Joseph, he who is not a war chief, nor becomes one, states the basic trait of not only the Nez Perce, but most Indian tribes: They have no centralized government. Each chief only speaks for his own band, and even then individuals may decide for themselves what they wish to do. Chief Joseph, the caregiver for the weak and helpless, recognizes that he speaks only for himself and his band. He is reconciled to a future life on the reservation. Thus begins the Nez Perce War and the 1,200 mile trek as the People seek to flee from the Bluecoats, first to the Crow, then toward Canada. While there are battle scenes as bloody as only ones in which one side fights for life and survival, while the other fights to win regardless of the cost, it is not the War or even Chief Joseph that is the primary focus of the story. It is the characters, their beliefs, their preconceptions, the slow revealing of the motivations that ultimately govern their behavior. From General Howard, old Cut-Arm, who lost his right arm during the Civil War, and has never lived down the belief of many in the Army that he was incompetent and a coward during a major battle; to Lieutenant Wood who eventually questions whether Government policy is right, Vollmann creates a masterpiece of nuance, of lyrical descriptions of the landscape, of empathy for not only the Nez Perce, but for tormented, slightly paranoid General Howard. Notes, glossaries, and bibliographical references are extensive and cover nearly 300 pages. One is astounded at the depth of Vollmann’s research, and his careful noting of what is rooted in his imagination as far as characterization is concerned, as well what is factual. 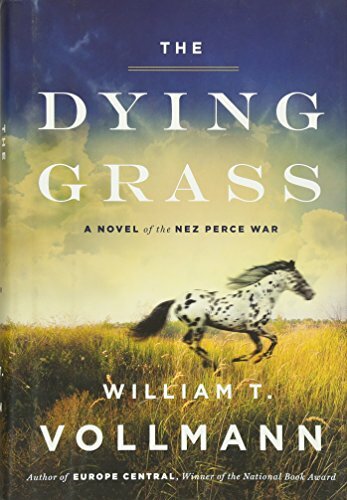 The Dying Grass is a novel for the dedicated reader; that is, one who enjoys a many-layered story that unravels slowly, which is told in an unconventional style. Vollmann uses space to indicate emotional or physical distance. He also may indent lines multiple times to indicate the thoughts or dialog of several different characters. At 1,367 pages it’s too long for this 140 characters digital age. This is not a novel for the casual reader who wants a fast story quickly told. Nor is it a book one may pick to read a chapter or two before going to sleep. The Dying Grass requires concentration, but the rewards are worth the effort. Highly recommended.